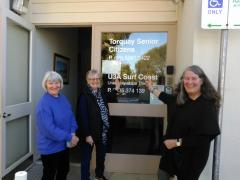 U3A SurfCoast has now moved from the Community House in Price Street next door to the Senior Citizens, 16 Price Street. Our office hours are still Fridays from 10 am to 12 midday. We will be having an official opening and celebration in October during the Seniors Festival so please mark this date in your diary – October 9th (2 – 4pm) at the Senior Citizens. From Monday to Thursday you can still visit the Community House for enrolments and other U3A information.